The place itself is not spacious, I can say it’s quite small. It’s just a space in front of the outlets and from where you sit, you can directly see some clothes hanging. But it is somehow cozy enough, especially the seats near the front door – my favorite spot! It’s interesting how they managed to attracts foreigners more than Indonesian people here. I mean, 80% of the regular customer is either Singaporean or Malaysian. They really wished they could attract more locals! 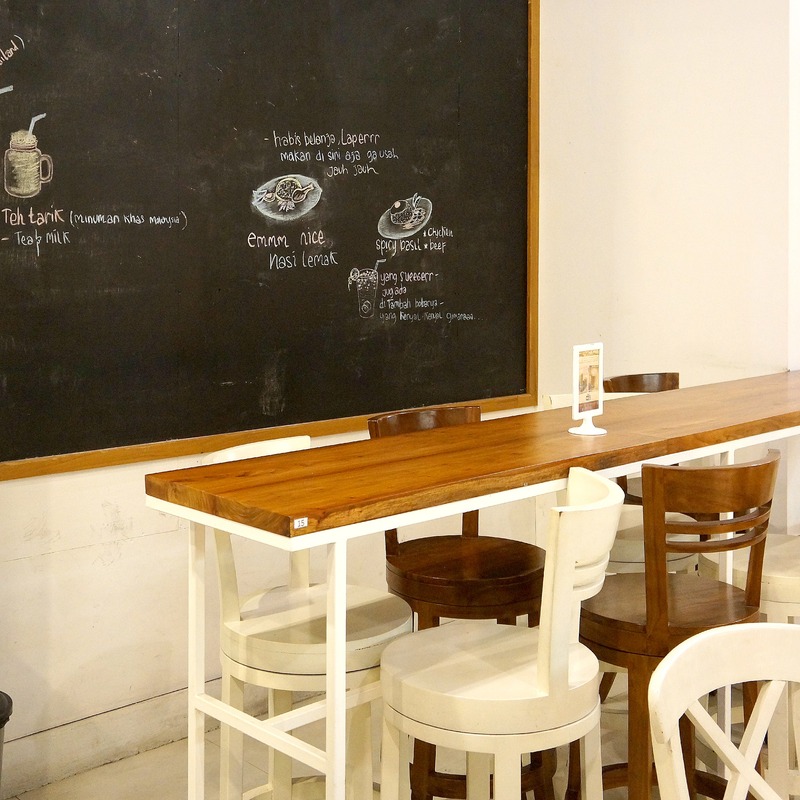 We got a lot of food this time since I went there with some ‘Bandung Foodies’! So let’s just start our dinner with the appetizer, shall we? 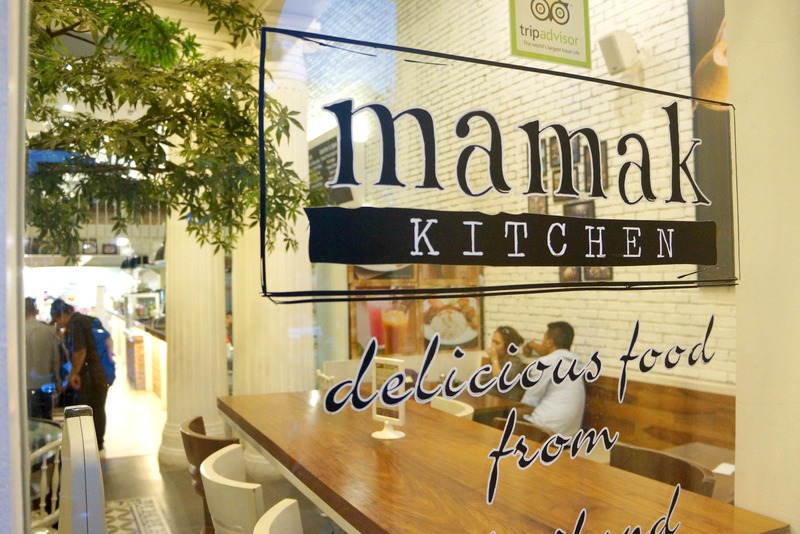 This one is a pure creation of Mamak Kitchen, and it seems that they are very proud of it. Crispy Thai Salad. It mostly consists of Jangek (if you don’t know what it is, go Google it. I’m just gonna give you a hint : it’s a cracker made from buffalo’s skin!) with peanuts, paprika, and the sweet and sour thai sauce. It’s a nice unique appetizer and you won’t find it else where, so make sure to order this one! You know, among all Thai cuisine, my favorite one will always be Tom Yum. (But if I have to choose between Tom Yum and Pad Thai, I’ll choose both!). Tom Yum here is quite different since they serve it with noodle. I usually have my Tom Yum as a soup to my rice. But since we got noodle here, I don’t need any rice! It tasted just right. I mean, the amount of sourness, spiciness, saltines is just perfect. Too bad I can’t really taste the fresh seafood. 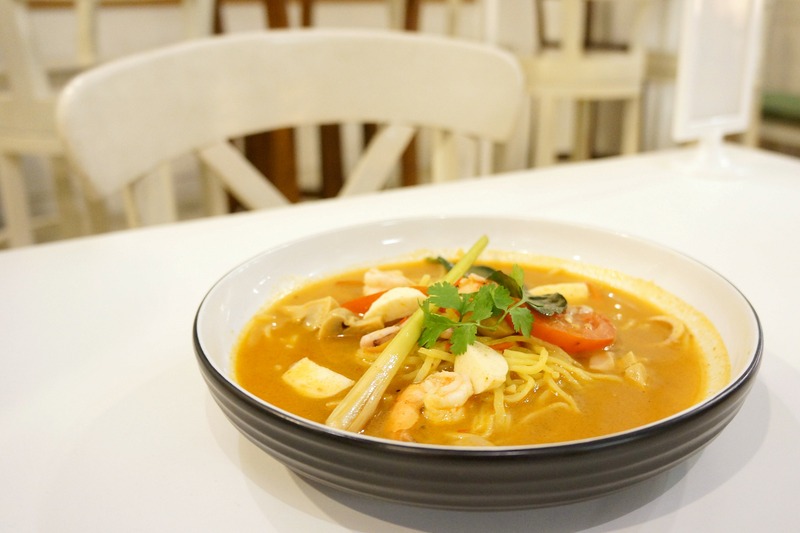 But it reminds me of the Tom Yum I had in Breezeo Resto in Pattaya, Thailand approximately 3 years ago. And oh! A handful addition of cilantro would be heavenly good. Malaysian cuisine will never be complete without Nasi Lemak. I think it’s considered as the national dish of Malaysia! 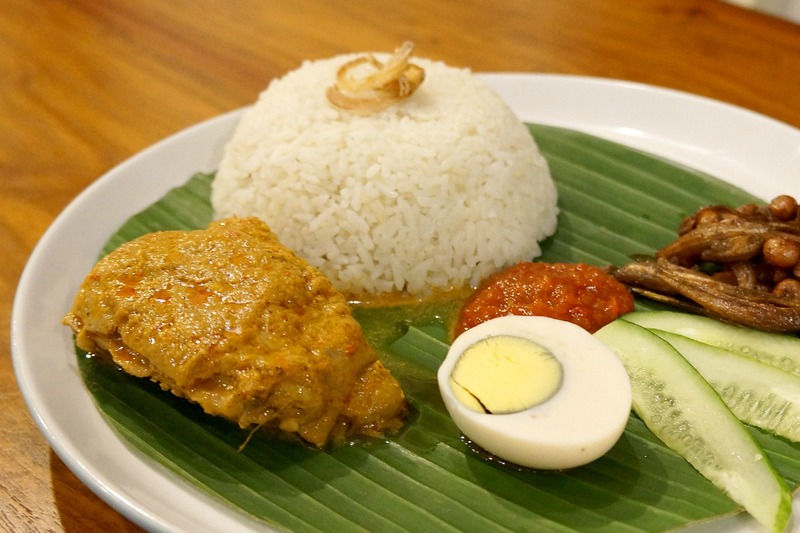 Nasi Lemak is rice dish cooked in coconut milk, and sometimes people add pandan leaves to make it more fragrant. 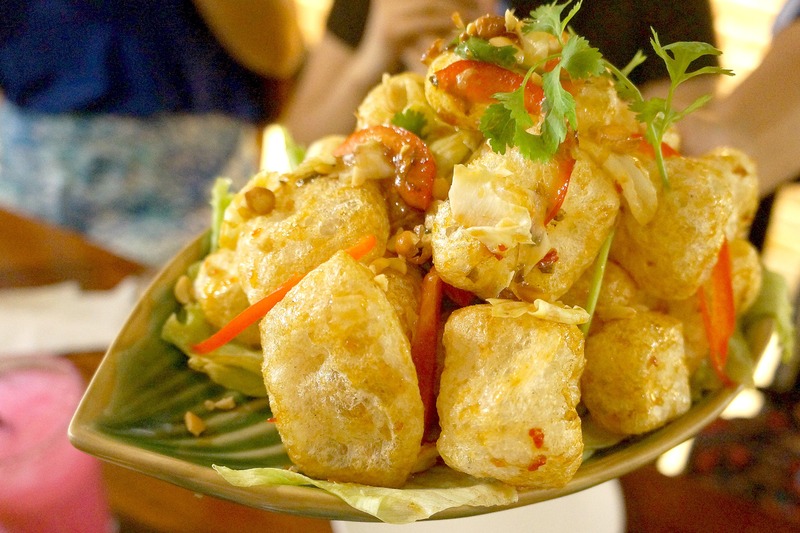 It’s served with chicken curry, but without the curry soup, boiled eggs, peanuts, and a sweet chili. Yum! All part of the meal was just perfect for me. Just how nasi lemak should tasted like. The “spicy” word frightens me, like, seriously. But, I don’t really think this one is spicy at all. It’s actually kinda salty for me. And sweet as well. I don’t know how to describe it, as I’ve never had anything like this before. The basil smells so strong. 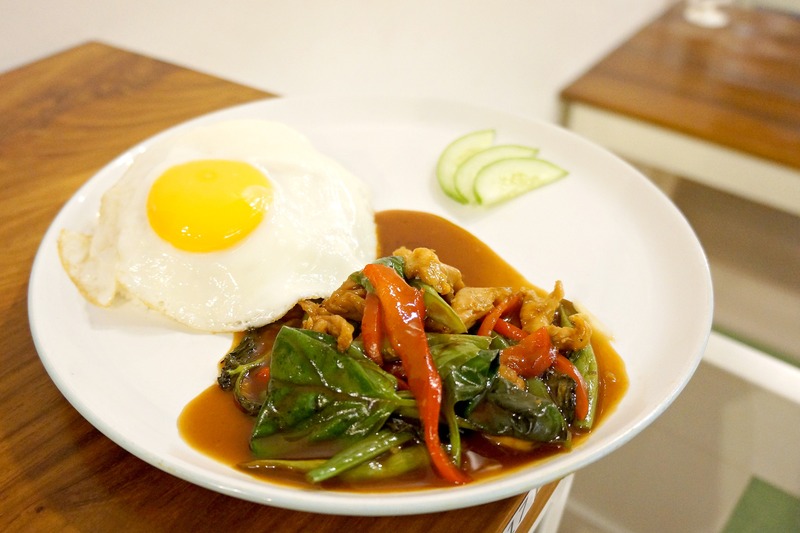 This one’s served with a sunny side up egg and steam rice, which is hidden underneath the egg. Hainanese chicken rice is definitely on top of my list. It’s my all time favorite food. I always make sure to have a plenty amount of chicken rice whenever I visit Singapore. And you know what? It’s so easy to cook – just need a couple of hours to make the chicken broth (I think 1 – 2 hours would be enough) and then the rest will just follow. This one in Mamak Kitchen is actually kinda good! I can taste the chicken broth which seep into the steamed rice. I like how thick and soft the chicken meat is. And I love love love the soup. Plus, they serve it with a kind of chili sauce my mom usually made! I don’t know how to call that particular chili sauce, but it’s made of chili, white vinegar, salt and sugar. And water I supposed. Well, that’s how my mom made it and this one tasted just exactly the same. It’s a perfect match for the chicken rice, trust me. 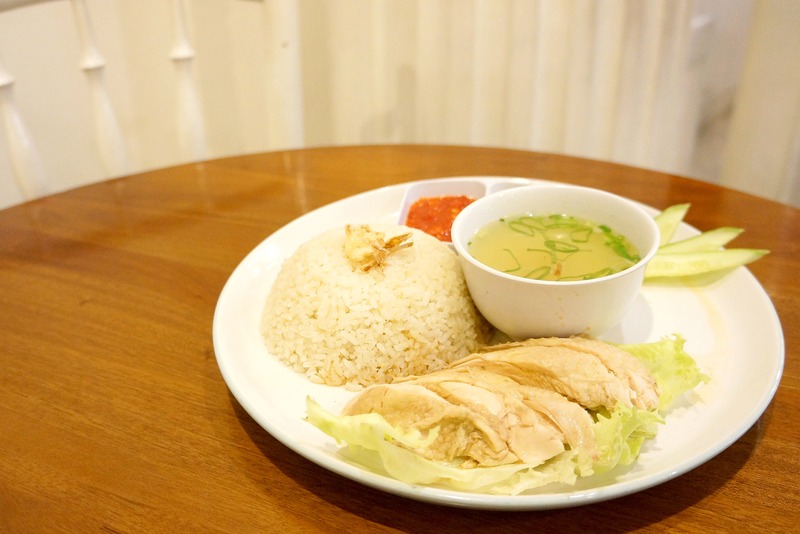 This one is another variety of the traditional chicken rice. 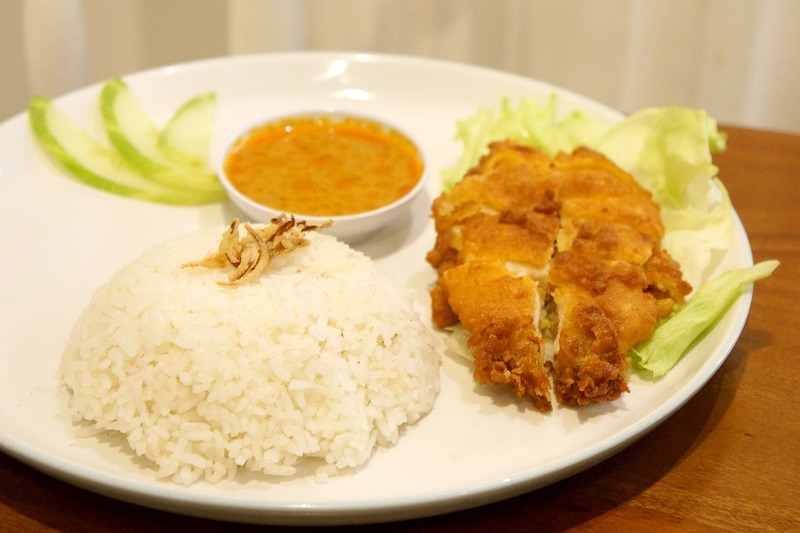 It’s hainanese rice, with I don’t know… chicken katsu? And a tiny amount of, curry soup? This whole combination is kinda weird for me. I’ll just stick to the traditional chicken rice. I wondered what horfun actually is. Turns out, it’s just the same with what we usually call Kway Teow, a rice cake strips. This one is kinda good. 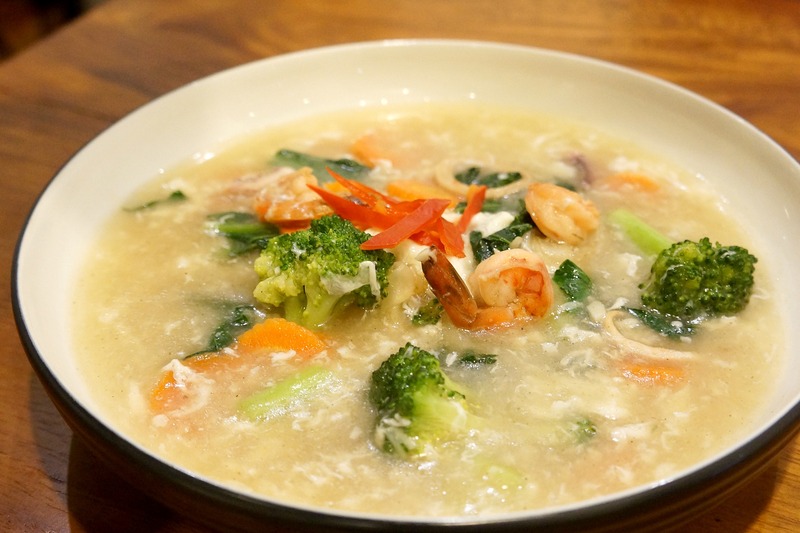 The horfun is served with some veggies and seafood, with a big amount of thick soup. The soup was so savory that I can’t complain. 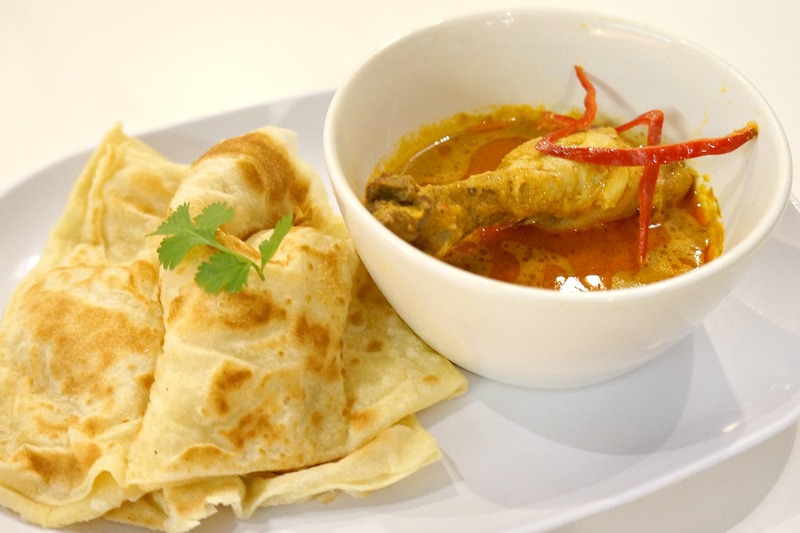 Roti Canai is the specialty here in Mamak Kitchen. It’s freshly hand made every day! It’s basically a fried Indian-influence flat bread and it’s usually served with curry soup, like this one. Make sure to eat it while it’s still hot or the bread will kinda hardened. And forget about eating your Roti Canai with your fork or spoon. You know what? The best way (and the easiest way) to eat it is by dunking it to the curry soup with your fingers! I usually always sticks to the food which is served traditionally, just how the way it should be served. You know, I’m not into fusion cuisine. But this one surprises me. 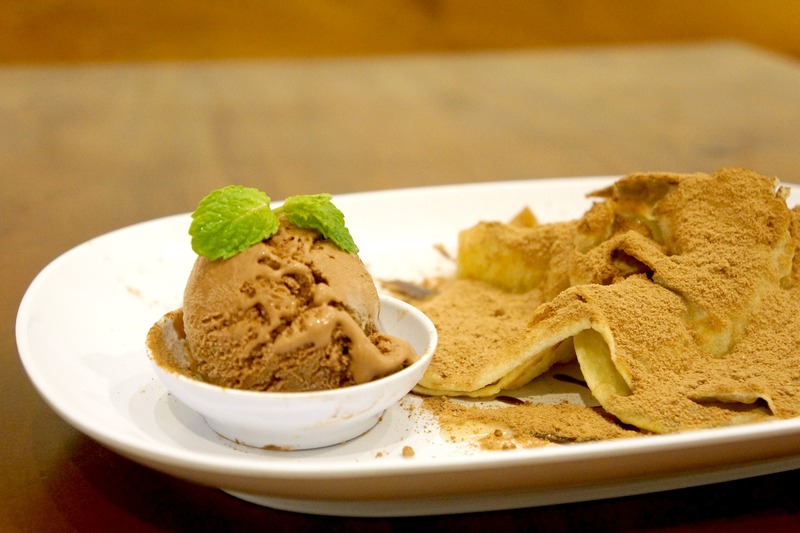 Roti canai should actually be served with curry soup, but turns out chocolate (I think this one is Milo) and chocolate ice cream makes such a great complement to it! Same thing goes to this one. 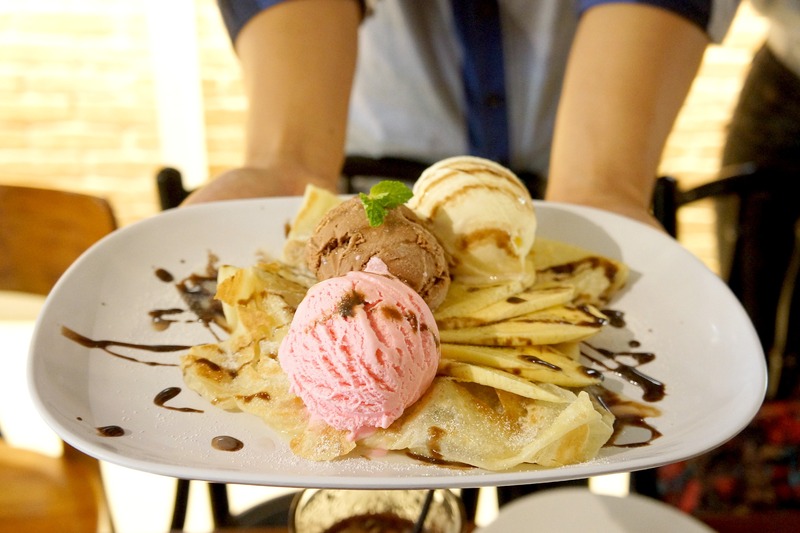 It’s served with 3 flavours of Ice Cream. Tasted… like banana split, but without the banana. Surprisingly, I like the one with ice cream better than the one with the chicken curry! Well, it really depends on my mood though. As for the drink, the have several kind of tea here. 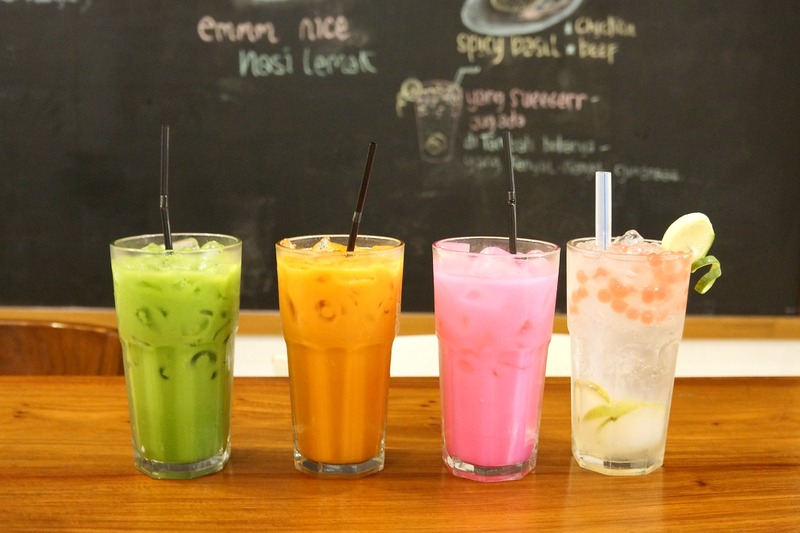 From left to right, they are Thai Green Milk Tea, Thai Milk Tea, Ice Bandung, and Ice Lemonade Boba. Guess, what? They imported the tea leaves right from Thailand. Meaning? It’s not an instant Milk Tea guyyys! But strange that for me, all of the drinks I had was too sweet, like too too too sweet I couldn’t even handle it. 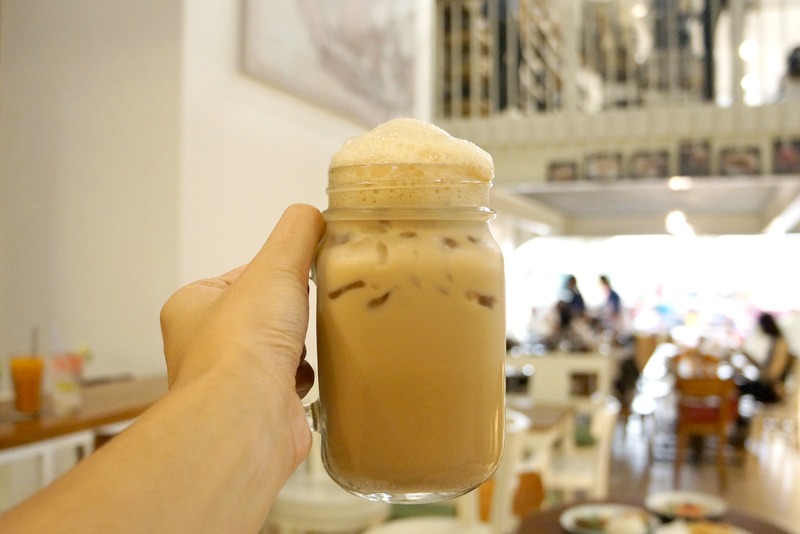 And this Teh Tarik tasted weird. I can’t really taste the tea. But I can certainly taste the sugar – which doesn’t taste much like a sugar. Well I think I’ll just stick to the ice tea next time. Overall, I like the food here but not the drink. 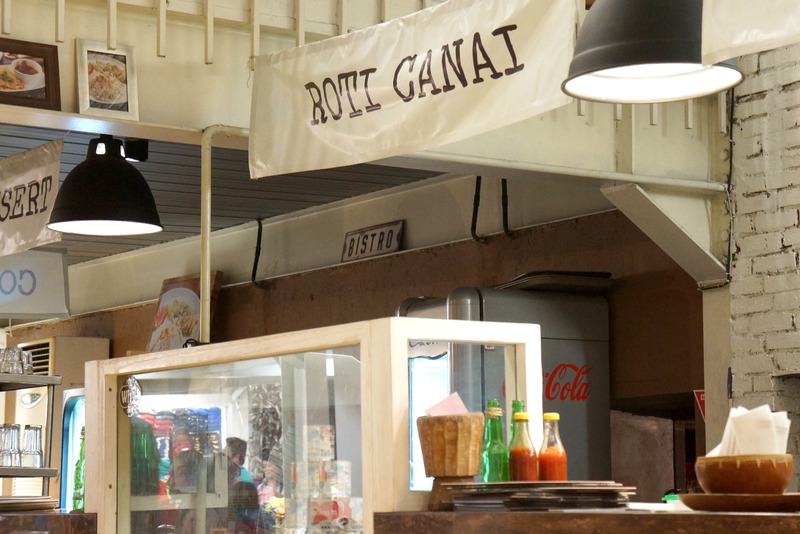 My favorite among all goes to Hainanese Chicken Rice, Tom Yum Noodle, Nasi Lemak, and Roti Canai – any kind of roti canai will do! Thank you so much Mamak Kitchen for the scrumptious meals. We really enjoyed it until our last bite! Hihihi siappp! 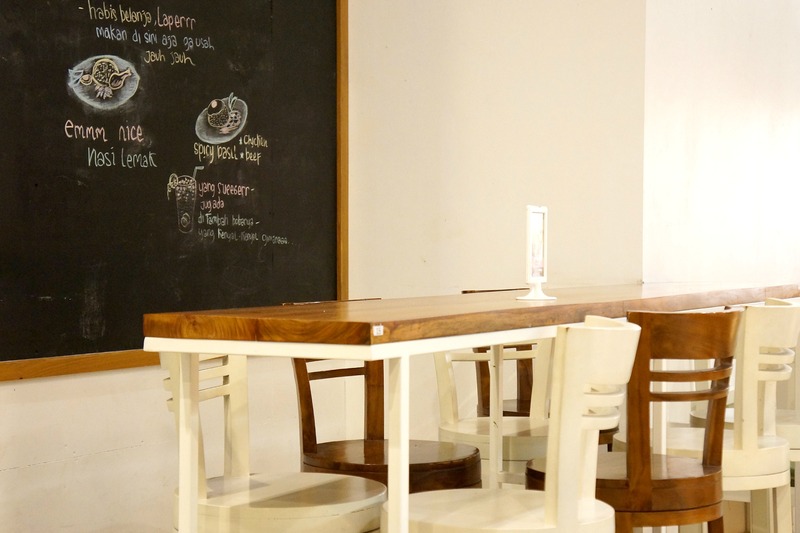 Ayo kuliner bareng. Never known they had come out with mamaks in Bandung. Finally! 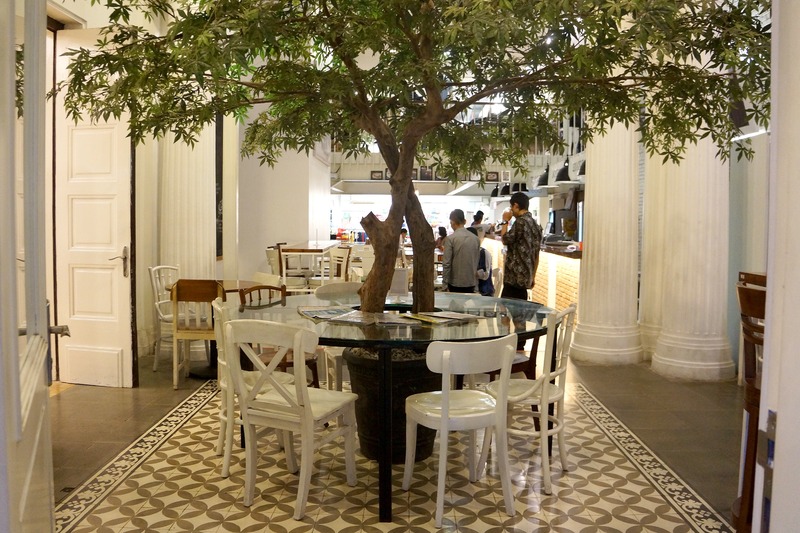 Yayyyy finally I could have a nice Nasi Lemak here!